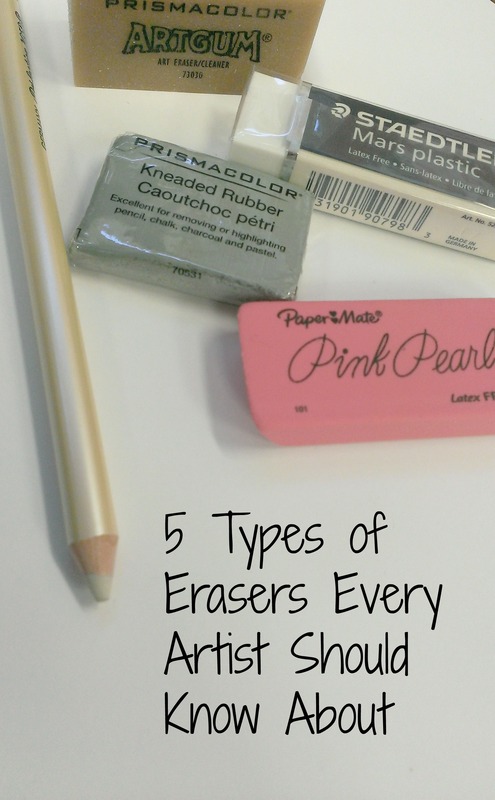 When it comes to art, not all erasers are created equal. You may see on your supply list something called a “Pink Pearl” or a “kneaded eraser”. These (as well as other types of erasers) are made of different material and have unique purposes. Take a look at the 5 types of erasers listed below to see how they differ. You are most likely familiar with rubber erasers. These are the pink erasers found on the end of every #2 pencil. In the art world, you may recognize the name “Pink Pearl” which is a pink rubber eraser in a wedge shape. This eraser removes graphite pencil on paper by shedding itself as it lifts the pencil marks. If using over-aggressively, these could tear your paper but with normal use, this does not happen. Gum erasers (also called art gum erasers) have a completely different feel than that of a Pink Pearl. While these are also made out of rubber, they are much softer than what we consider typical rubber erasers. When used, gum erasers tend to crumble but don’t worry, this it supposed to happen! The crumbs actually help absorb the graphite. The nice thing about gum erasers is that since they crumble when erasing, they do not tear up your paper. However, they also tend to not last as long as other erasers. Like the Pink pearl, art gum erasers are ideal for erasing graphite on paper. You’ll recognize these as being brown in color, sometimes semi-transparent. You may find yourself playing with this one more than actually using it to erase. That’s because it’s soft, flexible, and can be easily formed and sculpted into various shapes. Kneaded erasers work by lifting pigment (graphite and charcoal) off the surface. Because of this, paper is left undamaged with no smears. The flexibility of this eraser is popular among artists because it can be formed to a point for detailed areas – or whatever other shape is needed. To clean, simply stretch the eraser and fold over on itself (also known as kneading). If you’re working with charcoal, a kneaded eraser is a must! Vinyl erasers, also called plastic erasers, are the toughest erasers on this list. If not used carefully, they can easily tear through paper. These erasers are definitely handy as they can erase almost anything, even ink! Vinyl erasers are preferred by draftsmen because of their clean and complete erasing. They often come in white and can be found in a variety of shapes. Pencil erasers, or erasils, are made out of vinyl (as mentioned above) and come in pencil form. They can be sharpened to a point with a regular pencil sharpener the same as you would an ordinary pencil, making them ideal for small details, such as highlights in hair. It’s always a good idea to wipe the tip of the eraser while working so you don’t smear graphite back on your work. Don’t forget that since these are made of vinyl they are very tough and can damage your paper if not used carefully! Where would we be without erasers? Even without an official eraser, there’s always an alternative. Believe it or not, crust-less bread was used in Japan during the years of 1868 and 1912! As you can see, there have been many different kinds of erasers since then (rubber, vinyl, kneaded, etc.) each with unique qualities. Most of the time kneaded erasers are recommended for artists but you may prefer one of the other options available. We suggest trying a few out and finding what works best for you! And if you end up using bread as an eraser, let us know how well it works! We sell all of these here at Keeton’s. Which one did you need? I need erasils….are they expensive….how long does it take to reach ? I used to use bread to erase graphite when I was at art college. Its surprisingly effective and can be kneaded like a putty rubber. Best to use fresh moist bread, though! Perfect Adriana! We never thought of that. Thanks for sharing!! Have used a graphite pencil to make detailed sketch on gessoed canvas, and now I found out that the lines will show through oil paint. What is the best way to erase these lines off the canvas.. ? Will a regular rubber eraser work or should I use a kneaded eraser? It is generally recommended to do an undercoating first and then do a rough sketch of the basics of your oil painting with the actual oil paint itself. With that said, the best eraser to remove graphite from our experience is a kneaded eraser. Thanks for your suggestions. Just that my painting has a lot of buildings and to get the perspective right, I had to use a pencil. Read many posts on this subject and got myself a kneaded eraser, which helped a lot. Now, doing the underpainting to bring everything together. Let’s see how the final painting turns out. Can you tell me what is the best way to capture the sharp lines of building with brush? My lines are always shaky and can’t seem to steady my arm. What brand of pencil eraser is the best to buy? There are a ton of different erasers out there. What exactly would you be using it for? Looking for a mastic eraser. (eraser #6). Hi R Strong! You can pick up a magic eraser pretty much anywhere these days… CVS, Walmart, your local grocery store. Hope that helps!